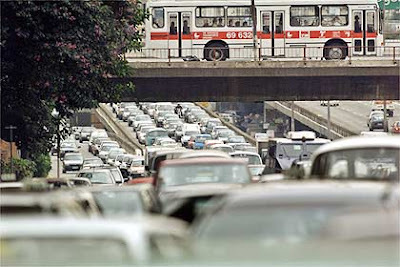 Traffic jams and financial crisis are the reason why people rescue an old habit: get ride. The practice is coming back slowly to encourage people sharing car or taxi to go and back from work and school. Among the initiatives there is the site Juntoo.com.br and the project MelhorAr - Mobilidade Sustentável developed by Lincoln Paiva, which was based on American and European initiatives. MelhorAr offers a free program that helps companies to organize rides. The software offers routes, timetables and even radio stations (in Portuguese) for those who want to offer or find ride. It also calculates the cost of fuel to be shared and the amount of CO2 released. In 2005, the Belgian Rik Van brought the idea of the site Taxistop for Brazil to create the Juntoo.com.br. This website helps students, colleagues and taxi users to organize a ride. On this website, there is a list available to find when and who wants to split transport. It's prepared for the city of Sao Paulo and Rio de Janeiro. Have a look!